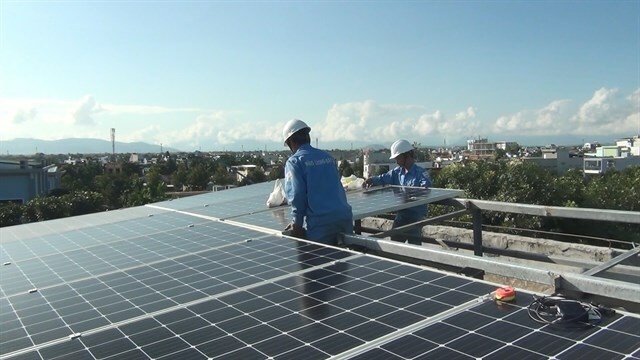 Rising concerns about the environment and livelihoods are setting barriers to developing solar energy in Vietnam, experts have said. The experts were speaking at a conference entitled “Solar energy Vietnam: grid integration challenges and opportunities” hosted by the National University of Civil Engineering Vietnam (NUCE) and the KU Leuven Belgium, with the support of the Embassy of Belgium in Hanoi. Solar energy harvesting, especially through the Photovoltaic system, has witnessed a boom in recent years. The Government’s decision No 11 released in 2017 has created good conditions to accelerate the industry. Since then, Vietnam has attracted 20GW of large-scale developments, which makes the country the regional leader in solar energy. “Vietnam is standing in front of unprecedented opportunities to develop solar energy,” said renewable energy expert Nguyen Van Khai. He said 242 solar energy projects have been registered. Some 100 projects are at the stage of closing deals with Vietnam Electricity (EVN) and 50 are due to come into operations. The buying price for each kW rises, from 1,800 VND to 3,000 VND (0.078 to 0.129 USD). At the same time, the cost for solar panels and accessories has fallen. Beside the large-scale projects, people are interested in smaller rooftop installations. He stressed the advantages of solar energy systems installed in isolated areas, fishing boats or shrimp breeding ponds to serve basic needs. However, new projects are causing concerns over grid overloading and suboptimal operation of PV installation. Environmental concerns including the rapid growth of population, urbanisation expansion, the diminishment of agricultural land for solar energy projects and impacted communities have posed challenges to solar energy projects in Vietnam. These problems have called for more innovative and comprehensive solutions that are not only technical but also socio-economical. At the conferences, participants touched upon innovations in solar harvesting and storage technologies which offer integrated solutions for also food production, cultivation and sustainable development. Vietnam’s annual power consumption has increased by 10 percent in recent years, putting the country at risk of power shortages in the future. Renewable energy like solar and wind would play an essential role in helping Vietnam complete its long-term goal of connecting the whole country to the national grid. Both home rooftop systems and large projects invested by domestic and foreign investors are main focuses of the country’s solar power development plan. According to experts, Vietnam’s solar system had a potential to reach 35,000MW by 2030. Government has applied tariff incentives or renewable energy payments for solar power since 2017 in an attempt to accelerate investment in renewable energy. The fixed solar power price is set at 2,086 VND (0.08 USD). The Ministry of Industry and Trade is working on new prices for solar energy based on geographical zones and opening the floor for feedback.